Growing government initiatives, increasing construction market, rising demand for next generation electronic security and lighting control systems, coupled with increasing CO2 emissions are some of the few factors that have resulted in the overall growth of building automation and control market in Saudi Arabia. Government initiatives to reduce CO2 emission level in the country by 2030 is further expected to boost the growth of the market, predominantly building energy management systems. Amongst all verticals, residential, hospital & healthcare and retail & logistics verticals have led the market revenue and expected to maintain their market dominance through the forecast period. Additionally, central region of Saudi Arabia accounts for the largest share in the market followed by the western region. 12.3	Bosch Security Systems, Inc.
12.5	GREE Electric Appliances Inc.
12.21.2	Lenel Systems International, Inc.
12.21.3	Otis Elevator Company Saudi Arabia Ltd. 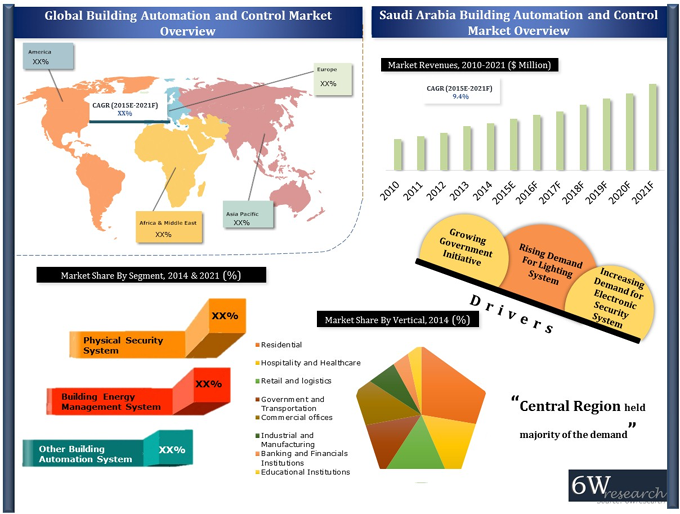 Growing government initiatives, increasing construction market, rising demand for advance electronic security system and lighting control system, and emergence of smart homes are the key factors that are spurring the market for building automation and control market in Saudi Arabia. In the country, the market is primarily driven by building energy management system market followed by the physical security system market and other building automation system market. Government initiatives to reduce CO2 emission level in the country by 2030 is further expected to boost the growth of the market in Saudi Arabia leading to increasing demand for the building energy management systems in the country. Amongst all verticals, residential, hotels & healthcare and retail & logistics verticals has generated largest revenue share of the market pie in the country and would maintain its market leadership through the forecast period as well. “Saudi Arabia Building Automation and Control Market (2015-2021)” report estimates and forecast overall Saudi Arabia Building Automation and Control Market by revenue, by type such as physical security system, building energy management system and other building automation and control system market, by application, and by region such as eastern region, western region, southern region and central region. The report also gives the insights on market trends, company profiles, market drivers and restraints.